Protesters with Spanish flags staged a demonstration to defend a united Spain. Catalonia's separatist leaders came under growing pressure on Thursday as Spanish judges ordered the suspension of a planned session of the Catalan parliament and reports emerged that several of the region's top businesses were planning to move out. This as Spain's Constitutional Court ordered Catalonia's parliament to suspend a planned session on Monday, during which separatist lawmakers planned to declare independence. 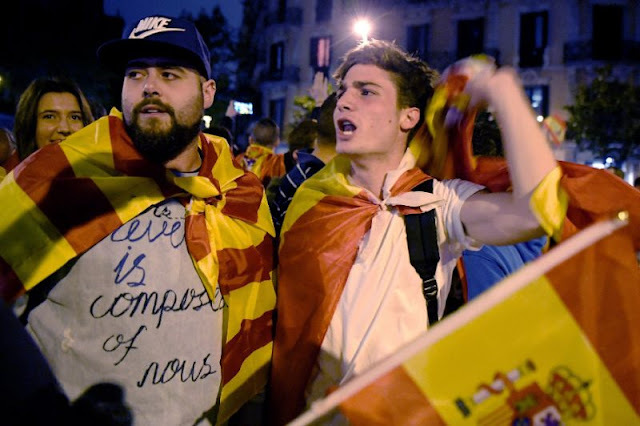 Thursday's ruling raised the question of how the Spanish state will respond if Catalans separatists decide to push ahead with their plans to break away. Catalan regional president Carles Puigdemont and other regional leaders have said they are not afraid of going to jail over their independence bid. They carried out last week's independence referendum in defiance of a ban by the Spanish court and stern warnings from the national government in Madrid. The speaker of the Catalan parliament Carme Forcadell warned such a move "would just increase support for the pro-independence side". Catalonia is the country's richest region, accounting for a fifth of Spain's economy and home to thousands of domestic and foreign companies employing millions of people. Spain's fifth-biggest bank Sabadell decided on Thursday to shift its registered domicile away from Catalonia in an administrative process expected to take a few days, a company spokesman said Thursday. Catalonia's biggest lender CaixaBank will also hold discussions on Friday about possibly shifting its legal domicile out of the region, a source close to the matter told AFP. Spain's Finance Minister Luis de Guindos played down the economic threat, insisting Spain would block independence. "This is not a question of mediation... This is a question about enforcing the law," he told Bloomberg news agency. Barcelona Football Club, a powerful symbol of Catalan identity, and its captain Andres Iniesta called for dialogue to settle the crisis. "Before we do any more harm, those who are responsible for all this must hold dialogue. Do it for all of us. We deserve to live in peace," Iniesta wrote on Facebook. His Spain team mate Sergio Ramos of Real Madrid said he hoped the crisis will be "resolved as soon as possible," speaking at a news conference ahead of Friday's World Cup qualifier against Albania. But Ramos also said "hats off" to Spain's King Felipe, who angered Catalan leaders by calling them to drop their independence drive. Madrid branded Sunday's vote a "farce" and Felipe VI sided with the central government, accusing separatist leaders of endangering Spain's "stability". Elsewhere on Thursday, a summit of southern European Union countries scheduled next week in Nicosia was postponed due to the Catalan crisis, Cyprus President Nicos Anastasiades announced.